If you want to know the details, keep going. To add to this incredible useful experience growing up, as an early-career company-grade Air Force officer I attended Air Force Combat Aircrew Survival Training at Fairchild Air Force Base in Spokane, Washington. In short, it was a three week, sometimes grueling course in all-things-required to make it. This was not the Boy Scouts any more. BUT, I was prepared, as it turned out, in many ways perhaps, that others with me in that course were not. I was familiar with virtually everything we were instructed in and most everything we did. Of course, in Scouting you do not learn “E&E” – Escape and Evasion – in case you’re shot down over enemy territory and the BSA doesn’t directly teach boys the best ways to survive being a prisoner of war. But the other things – the fundamentals and beyond the fundamentals of basic wilderness survival – I had been exposed to long before. And I was pretty comfortable, all things considered. I enjoyed the course, learned immensely from my instructors and found a renewed and reinforced sense of confidence. 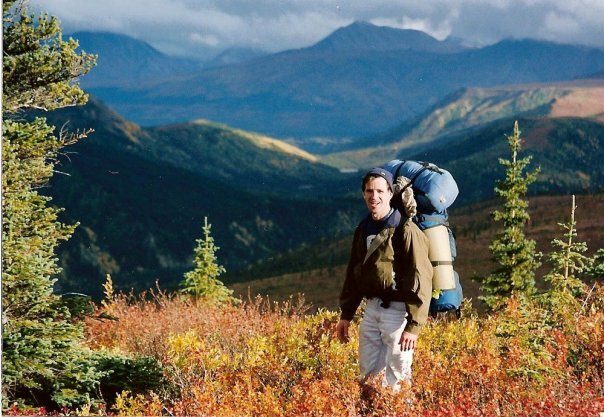 Then, in the early 1990’s I traveled to Alaska with my friend, Matt, to explore. We did plenty of non-wilderness stuff, and all fascinating and adventurous, but it also included three days spent in Denali National Park. We backpacked. We attended a required half-hour how-to-not (maybe) get-eaten-by-a-bear safety course immediately prior to setting out. We had all the gear we needed, including compasses and maps, water, shelter, rain gear, food and confidence. Notice what I left out – what we did not have: cell phones. No such animal. (Or if there were, we apparently didn’t know about them.) And we went almost entirely off-trail. And the entire three days we were good. Except . . .
On Day 2, hiking across a high open ridge, with a view of a thousand miles sweeping in mountain peaks and the vast forest surrounding us, we heard a creek rushing far below, down a steep slope sparsely covered in rough vegetation, boulders and small pines. It was obscured by the great stand of immensely tall pines that marked the beginning of the deep woods. We needed water, so we headed down. Except that we took off our backpacks before heading down. It was a very steep slope, and traversing it with the packs would make it additionally difficult and anyway, we’d go straight down, fill our water bottles, and returned the way we came – straight back up. Apparently we did not realize the angle that we moved down the hill; the jogging around our natural obstacles to get to the creek. And we certainly didn’t following the exact route back up. But we thought we had. We assumed it. It didn’t take but a minute to realize our backpacks somewhere else. And in this brief moment of lapse in judgment, we were lost. Here we were – middle of nowhere, all the gear we needed, map, compass, hiking partner, beautiful scenery – and no trails. We just went. And we were fine. But the moment we were without our stuff – we were lost. And it got serious. Uncomfortable doesn’t quite describe it. We were stressed to a near breaking point, half with fear and half with frustration and feeling stupid. We knew better. Especially me. Inexplicable and unexplainable. And stupid. We searched for about 30 minutes before we found them. It would be hard to describe the feeling we felt at that moment; the sense that this is what it must feel like to be saved somehow. How lucky we were, someone might say. We sure felt that way. When you’ve got your stuff, you can go anywhere and be ok. When you’re without your stuff – your resources, you’re lost. It’s that simple. There is another kind of lost, a more serious one, I think. And it takes a few key things to get back to where you need to be safe and secure. In recent weeks I have been working full-time networking. The meeting people for coffee and exploring new possibilities for my life’s paid work-kind of networking. I have started my own LLC’s. Two of them. I am exploring my options to strike out on my own and head off in a new direction with a new profession or with a new organization. But it’s hard work of course. The unemployment rate has been recently celebrated as dropping as low as 5 point something, but when you’re one of that number, it doesn’t matter if it’s 5 percent or 85 percent. Your experience is the same no matter. You’re out and you want back in. You need to get back in. And in that crucial time, for many, life can get to be quite a struggle. The statistics always describe a portion of the unemployed as those who have stopped looking. If the of unemployment claims filed in any given week is one indicator, the number of those who are no longer looking is another to focus on. That’s where this comes in. Consider that group. What must it be like for many? I mean really – the human condition, the family-psychological-social-financial-emotional impact of it – especially over time. LinkedIn is not directly a counseling group or forum for those who are hurting. It’s a stay on or get on or improve on or find your game place for professionals. It’s all business. It’s not a place where you’d necessarily look to find counsel of the religious institution kind. LI does provide a get down and get busy, no-nonsense vehicle for the seeker-networker. It’s my primary business tool for all that is new career seeking-related (and it‘s a great tool). But as I read articles every day, I am reminded just how human LI is. With the crux of this piece, I am expanding a bit further to address the whole person perspective – realizing the internal difficulties people may and do often experience. I know, obviously, there are days when any of us are dragging pretty badly; perhaps especially on a Monday when the energetic inspiration to get going once again is nowhere to be found and discouragement is overwhelming; perhaps on the Friday of a not-so-productive week when you’re glad it’s finally over and maybe you can try to have a “normal weekend” like “normal” people do – even employed people don’t knock themselves out working on Saturday – you can fake it ‘til you make it to Monday, then try again. And the inside scoop is – these are things I believe in and am doing. I am not always great at them, and I don’t always get all of them done every day, but I believe they are valid and important and they make a meaningful difference. These four things may not fit everyone, but they will fit a lot. Whether they fit you exactly is not so important. You get the message. Find a way to figure out your own version of these. And yes, I’ll proselytize here. My basis for this guidance – this structure – this whatever you might call it – is New Testament Biblical. Luke 2:52. It’s the Balanced Life model – the four parts to a balanced life. Mental, Physical, Social, Spiritual. This is my Stuff. I need this stuff. In his book, Choose Yourself, James Altucher effectively calls this The Daily Practice. He does not equate it with Luke. He doesn’t use the exact terminology. He might even say that he doesn’t mean it the same way. (That’s what I took from it, but you may take something entirely different.) I am guessing he didn’t use the New Testament as one of his references for the book. I dunno for sure, but I don’t think so. The point is – it’s a nearly universal idea – the Balanced Life. I’ll even go further out on the limb and say it’s needed universally. You may not call it Biblical. You may call it something entirely different and get it from an entirely different source. You may not believe or accept that it’s legitimate. That’s fine. That’s just where I get it. But the idea – the concept – of getting one’s life in balance, with regard to our time and efforts, thoughts and plans, hopes and desires, energy spent, relationships and reasons and so on – the idea of Balance – of moderation; not too much or too little of anything – I am convinced is good and important. So here is my list. It’s not the only list, and I don’t claim it’s the best list for everyone. I do think it’s a good list. Use it as you see fit. This sounds simple and obvious. Get up. Early. Take a shower, get dressed, eat. Healthy. All this sounds like pretty fundamental stuff, but you know who you are – the guy who has decided it’s no big deal to slip into casual dress mode for a whole week, and maybe not even shave. Instead, fake it. Be the guy going to the office. Do these things and get yourself going right away. Dress for work. Treat your home office or the coffee shop like your work place and there’s actually an office dress code. Dress the way your grandmother would expect you to dress. Set weekly and daily goals. Write them down – make a list. This includes a daily to-do list. And don’t feel bad about bumping unfinished items to the next day. Just prioritize with the mind of an adult, not a certain 13 year-old I know. Fill out your calendar, whether paper or electronic. If you plan you can execute – at least in theory. I begin with two-hour increments to my day. Two for requesting, setting, scheduling appointments; two for applications on-line (including researching companies, people, locations, etc. on LinkedIn); two for writing; and two for physical work (home stuff). I don’t always stick to it, and one often overlaps or absorbs another; often times outside appointments – the greatest preference by far – replace any, all or portions of these, but a daily plan is better than chaos and couch. Aim for appointments – several each week. Get out and go. Sure, it’s cheaper – especially on a tight budget – to stay home and work, but nobody is coming to your house to see what you can do for their business. Something happens when you’re out and working amongst other people – talking, meeting, brain-churning and strategizing – at a local coffee shop, even public library. You might just meet that recruiter or hiring manager or small business owner who needs what you are good at. Especially if you make a plan and ask them to meet you there to talk about it. Generally communicate. Reach out to people. Emails. Requests. Phone calls. Thank you’s. Repeat. If you actively and proactively do these, they will [eventually] generate more activity – and get you up and out and back “in”. Do this as you do: Constantly think in terms of offering – offer what you can do for someone. You are on a mission to help – help solve problems, help a person or an organization. Think not in terms of asking, but in terms of offering. Speak the language and have the attitude of offering help as you communicate. Physical work. This is a variation on the Run theme. Take a break to get sweaty. Your home, in whatever form it is, probably needs maintenance. You probably have laundry to do. Take a break to get things done. It will make all of your work go better. 2) Subscribe to Runner’s World magazine. 3) Or do something Physically Vigorous. Running may not be your thing. Or it may not be possible. If that’s the case, then ride or swim. If you can’t do those things, then walk. The point is obvious: Move. Daily. Do something physical and do it regularly. And do it vigorously if possible. Vigorous physical activity. Golf is wonderful and it can even be therapeutic in some ways. Just don’t think it will give you the same benefit as sustained vigorous exercise. Get out, move, breathe, even sweat. What’s the worst that can happen? You die. Well, at least you die trying. A lot nobler than being found on the couch half-covered with an old blanket and your cold, stiff hand deep in a nearly-empty bag of chips. Many days – too many days, I don’t run. But when I do, I feel better for it. Even my mind works better (I think). Actually, I do think. I think lots when I run; like my mind spins and zips with creative and positive stuff. I need a notebook and pencil with me when I run. Running burns off stress. If I only run two days in a week, that’s not really enough to save my life physically; it would take real training with a regimen and maybe only one day off a week to do that, but it is enough to get the stress out and relax my heart from the worries of the day and my body of the tension of all that I am dealing with. If I eat lots of salmon and salad and celery, lot’s more than steak, and exercise – say, run – three days a week, I’m gonna get healthier. Rush Limbaugh occasionally talks about exercise this way: If it makes you feel better, then you should do it. But if you really want to “get in shape”, it’s not exercise; it’s diet. Eat less, and eat healthy. Period. Actually, a lot of people say this. I think I agree with them. A seriously healthy diet, low in fat and carbs and starches and red meat (which I love) and cholesterol and high in green stuff and fruits and vegetables and salmon (which I love) and piles of water and whatever recipes are in Runner’s World – all coupled with MODERATE exercise (maybe all this running or riding or swimming or a combination of these – at least walking regularly, say, a few days a week for at least 20 minutes – THIS is what will get you in “good shape”. At least it will get you going in that direction. I blog. And the more I look at what other people do blogging, I think I am not that good at it. But so what? One thing it does do for me – from a self-serving perspective – it provides an outlet for me. Call it an emotional outlet, or a creative outlet. It’s mental and emotional exercise. In a word – cathartic. Look it up. I have written in another (recent) piece that if you don’t tell your story, it will never be told. Yours – your perspective – the way you see things and the way you say things – is unique. No one else can duplicate you or your work. You are unique, so your story is unique. Tell it. Aside of the therapeutic effects, you may actually have something. Start a blog. Mine is at WordPress, but there are many. Many people write to make money; many even do it professionally, full-time. But plenty do it just because they have something to say. In the process their writing may even benefit others. At a minimum it will [probably] make you feel better and the exercise of getting it out will be good for you – your brain, your heart, your plan moving forward. My personal choice is to attend a men’s Bible study on Tuesday mornings. It also includes reading and silently praying. (I admit I am not so comfortable praying out loud.) For me it is not just an exercise in well-rounded discipline. I happen to suspect all “this” may be true. So I am motivated. If it is true, then surely there is something – a mission – a purpose – far beyond my present struggles and worries. If it is true, then I know (I buy into the prospect) there is a specific plan for me and my family and the world around me. I may not understand it or feel it or even believe it on occasion, but if it’s true, it doesn’t exist or not exist just because of what I think or feel. That’s certainty and security. The prospect and hope – the “what if . . . ” – are enough for me to play ball. And ultimately, with regard to this present discussion, it gives me the hutzpah to press on. You may have a similar view, or you may have one antithetical to any or all of this. That’s ok, of course. You may have no four-part Balanced Life concept to be interested in. You may have a three part approach that is otherwise entirely secular, I dunno. As I stated early on, these are not the only or the best Four Things for everyone, but I am convinced they are a very good start. If I weren’t, I would press them like I do. For me, this is my Stuff. Without this stuff, I am lost. I suspect most people need this, and desire it; are searching for it in some way, whether they realize it or not. Your list may look or sound different. You may fill in the details differently. Good. But fill them in. We all need our stuff. We’d be lost without it.
. . . In case you think running cannot possibly be for you . . . I love to run! A half-marathon is my long-term. goal…. : ) I enjoy writing, too. Check out my blog!